Following in the success of the Spanish horror film, [REC], Phase 7 takes a more comical look at the same scenario. 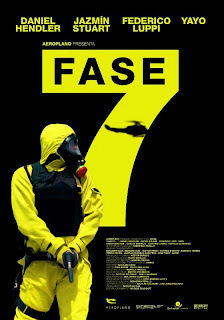 Yet another in a series of post-apocalyptic horror films that have popped up in many countries recently, Phase 7 also comes with a refreshing sense of humor and one of the best horror film scores in recent years. Not all of the material is original, and even the soundtrack sounds like it was stolen from an old John Carpenter film, but Phase 7 is still far more enjoyable than expected. Along with its throwback score, Phase 7 opens a lot like Shaun of the Dead. Coco (Daniel Hendler) and his pregnant wife Pipi (Jazmin Stuart) casually bicker as they do their shopping, unaware of the chaos around them. As they leave the store it becomes flooded with panicked people stocking up, and the world continues to fall apart as the oblivious couple return to their apartment. Even when the building is quarantined and they are forced to stay inside, neither seem to take much notice of the apocalypse occurring. Coco is only made aware when his paranoid neighbor begins to educate him. Although there is a danger of becoming infected with a deadly virus, Phase 7 is far more interested in the healthy people who turn against each other in a panic. The neighbors in Coco and Pipi’s apartment building begin to turn against each other, and they are forced to pick sides and fight in order to survive.